You can use Apple’s infrared (IR) remote control to control slideshows in PowerPoint 2004, PowerPoint 2008 and PowerPoint 2011. Here are some instructions for getting this set up. PowerPoint 2008 and PowerPoint 2011 both include support for Apple’s remote. PowerPoint 2004 does not natively have this capability. Instead, you need to use one of the third party applications described in this other article. Personally, I’ve used the free iRed Lite. First, here’s a little background. Starting in 2005, Apple started to ship remote controls with their iMac G5 computers. They then included it with MacBooks and MacBook Pros as well as the Mac mini. Apple’s intended users to use them to control FrontRow which lets user view movies (DVDs), photos and music. I think Apple must have realized that few people actually used the remote controls so they stopped including them with new Macs but they continue to sell the remotely separately for about $20. In 2009 they replaced the original white plastic remote and with a taller, thinner aluminum version. The remotes do have some uses beyond controlling FrontRow. Most commonly, I see them used to control PowerPoint slideshows. 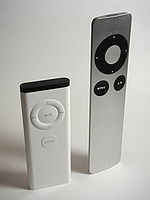 For a more thorough history of the Apple Remote check out this Wikipedia article. To learn about third-party products that allow the remote to control more applications and extend its capabilities in other ways, check out this article. Hold your remote control a few inches from your Mac. Simultaneously, press the Menu and Next (right-point arrow) buttons for 5-10 seconds. Open your PowerPoint presentation and click the Slideshow button to put it into slideshow mode. Press the Forward and Back buttons to move through the slideshow. Pressing the Pause/Play button will also advance to the next slide. If you ever want to unpair your Mac from a given remote you can go to the Apple menu, select System Preferences and then Security and click the Unpair button. I should also mention that the IR receiver is on by default in all Macs. This means that other people could walk up to your Mac, pair a remote with it and start to control it. This isn’t the worst thing in the world, but it could cause confusion. What really causes confusion is when there are multiple Macs in the same room and one person suddenly starts to use one of Apple’s IR remotes. The remote starts to control all of the Macs simultaneously. I assume this only happens if the Macs have previously been paired with another Apple remote. In these situations it’s useful to know that the Security System Preference pane mentioned above lets you check a box to disable the IR receiver in your Mac. Read more about Apple, infrared, ir, office, PowerPoint, remote control.